Science Watch offers their choices. How do you assess and evaluate those students? I have a colleague who administers only one assessment - a final. Most of the rest of my department uses a variety of activities, assessments and evaluations - homework sets, reading quizzes, writing, midterm and final. Here is the weighting we use to grade each semester in ec 10 at Harvard: 40 percent on the final exam, 20 percent on each of two midterm exams, and 20 percent on work done with section leader (mostly grades on problem sets done as homework, though class participation may be given some weight as well). In addition, we have an optional "unit test program" in which students can take practice tests throughout the semester and, if they pass, earn extra credit. I based this rule (the green line) on data only from the 1990s, but notice that it does reasonably well until 2009. The red line is the rule with parameters estimated from the later period. The second and more subtle problem is the nagging issue of the zero lower bound. For several years, the rule suggested a target federal funds rate deeply in the negative territory. We are out of that range now, but should the past "errors" influence our target today? An argument can be made that because the Fed kept the target rate "too high" for so long (that is, at zero rather than negative), it should commit itself now to keeping the target "too low" as compensation (that is, at zero for longer than the rule recommends). By systematically doing so, the Fed encourages long rates to fall by more whenever the economy hits the zero lower bound. Such a policy might lead to greater stability than strict adherence to the rule as soon as we leave negative territory. 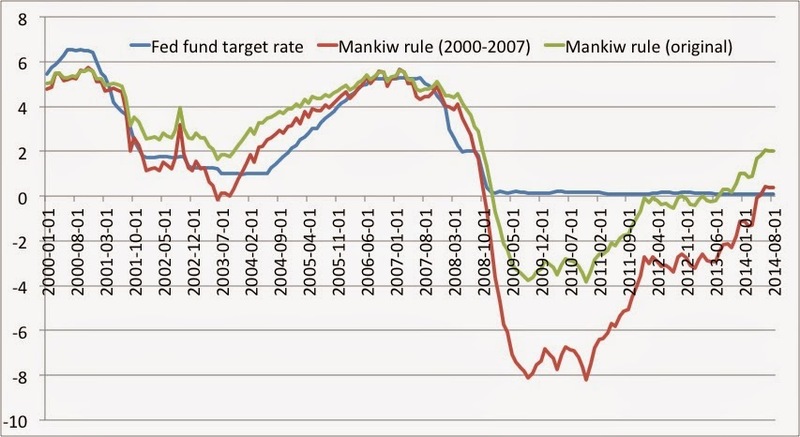 The time for the Fed to raise the target rate may be soon, but I don't think we are quite there. If you plot the PCE deflator, there is a clear shortfall relative to a 2% price-level target. A 2% price level target fits very well during Greenspan's time. By the end of 2008, we were exactly on the 1992-target. But when I look at that plot starting in 2009 until the most recent data I see a gap. most of our arguments are over things like Obamacare, or antipoverty programs, or financial regulation-- issues on which reasonable people can and do disagree. If you’re uncivil in this sort of situation -- if you call your opponent an idiot, or a liar, or a nastier name simply because you think his or her argument is bad -- you’re basically being overconfident. You’re assuming that there’s essentially no chance that you’re in the wrong, so it’s in the public interest for you to rail against your opponent and score points with the crowd. If you do this, there’s no chance that you yourself will learn anything from the encounter. For those who don't get it, I will post a hint in a few days. Hint: Try looking at the problem upside down.